Howard seen here in his indecisive “I don’t know what the hell I’m doing” pose; a recent favorite. After holding the sports world hostage for more than two months now, Dwight Howard has finally made up his precious mind on where he’d like to play. It’s not South Beach, it’s not Houston, it’s not Brooklyn but it DOES come with a New York ZIP code. Howard just signed a 1 year $24 million deal with the WNBA’s New York Liberty. Although this contract doesn’t come with Jay-Z or the über billionaire Russian owner but it does come with a locker room chalk filled with tampons and as much Midol as he could ever need. 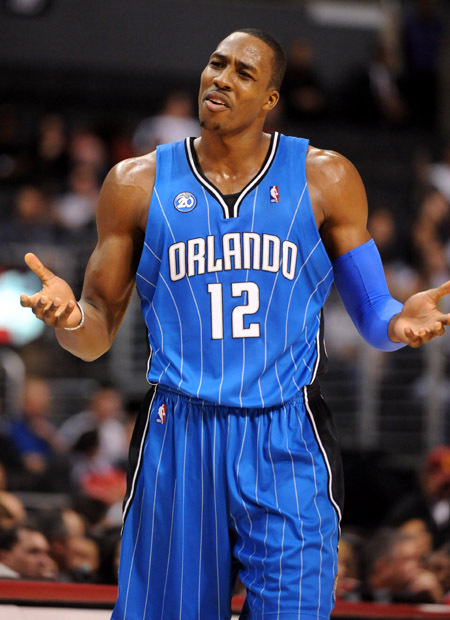 Howard’s agent was quoted Wednesday saying “Dwight is excited to start a new career in a new league. Sure there’s some question whether a man who is 6′ 11″ 285 pounds and build like clydesdale should play with a bunch of women…but there’s always skeptics.” Whether Howard signs an extension with the Liberty after this year or decides to be a grown up and accepts that his NBA future isn’t based on his whims, remains to be seen. As always, we here at the Cucumber Periodicals strive to be objective with our reporting…but this unprecedented display of immaturity has made ever break up in history look like an elegant tea party. Pinky’s out Dwight…pinky’s out.